HH Jayadvaita Swami has given two lectures during his short visit to Sweden. 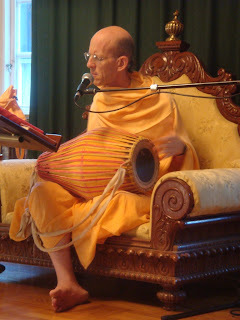 These have been recorded by Bhakta Nikita! Please go here to download. Here it is indicated that there is no need to ask for anything form the Lord. The Lord will automatically be attentive to our needs. 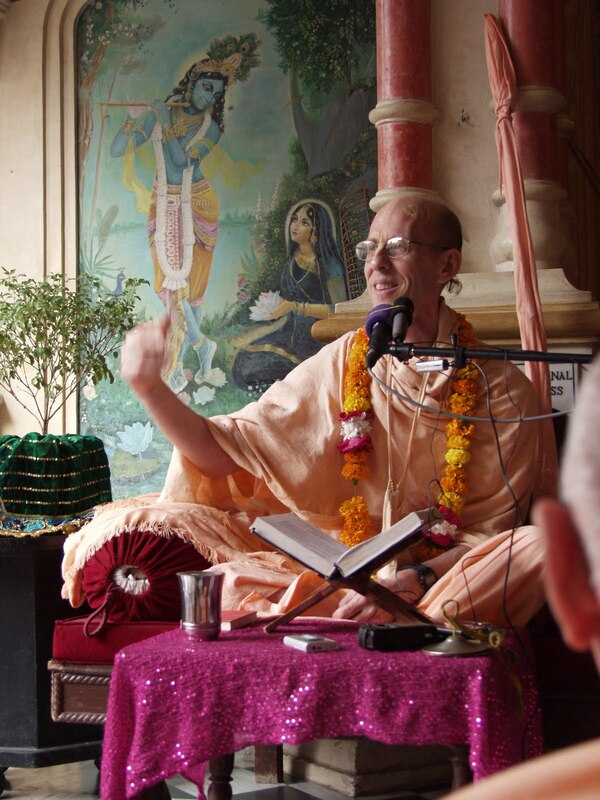 In BG (9.22) yoga-ksemam vahamy aham , Lord says, "I provide whatever a devotee requires and I preserve whatever he requires… I provide, I preserve." There is no need… the Lord is already maintaining all living creatures, than- why will He not maintain His devotees? Certainly He will. For that matter, there is no need to work very hard in this material world for maintainance, nor to go begging from others for our maintainance. The renounced life is meant for begging but not for one's own needs. A sannyasi actually does not go begging, because I need this, I need that. He begs for the benefit of the people he begs from or for his own benefit- by taking a role of a beggar he escapes the fault of false prestige. "I do not beg from anyone, I have everything, self-made man, whatever I want I get it or my disciples will get it for me", no- than one risks that pride. Better to be a beggar, so one has to be… just like we have to go and distribute books,"Please take this book, please give a contribution" We wont starve if they don't by a book, and we do not need their money. We can all go to Mayapur and chant Hare Krishna and Krishna will provide everything. Or we can stay here and chant Hare Krishna and Krishna will provide everything. But is for satisfaction of Krishna and the welfare of others. Yes it is for that. Maya... is a fierce competitor. So there is no room for thinking, "Now I just have to, kind of, make it through the next few years and not really screw up too badly and everything will be all right. Give myself a little slack." Maya will say, "He is weak, get him!" We should be careful. Such a valuable thing- we have gotten Krishna consciousness. So closely we should guard it. Just like we see here, all those warnings are there during the Mayapur festival, "If you have any valuables- be careful." And always there is somebody who is not careful who goes walking around with their passport or with their money. And some slick thief gets him. And the rest of us think, "I should be very careful with my money, I should lock it up, I should..."
So if we are that careful about our money, about our passports, about our airline tickets- how careful should we be about our Krishna consciousness, about our freedom from material existence, about our going back home back to Godhead? 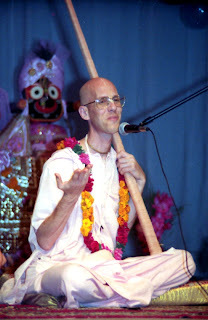 Oh, if I lose my Krishna consciousness it is OK as long as I do not lose my passport. We should be so careful. 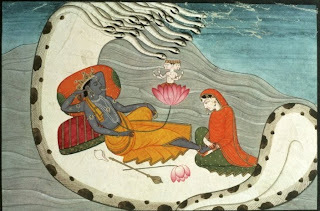 You can never be overconfident about the lotus feet of Krishna. And you can never be over-skeptical about anything else. The ultimate aim of this Krishna consciousness movement is to join with Radha and Krishna in Their dancing party. 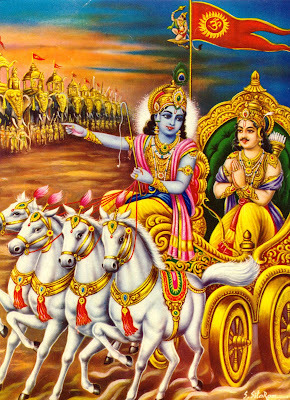 To join with Krishna and His energies in the spiritual world. But to do that we require love for Krishna. Now, how to get that love for Krishna? we say krsna-prema-pradaya te, Caitanya Mahaprabhu is giving love for Krishna. But how is He doing that? He has started the Hare Krishna movement- you got to the Hare Krishna temple and you put in your requisition: I want love for Krishna. On Friday we will deliver it if you give your order by six o'clock on Thursday. How is this love for Krishna being distributed? How do we get it? That love for Krishna is available trough sankirtan. By chanting Hare Krishna one can get love of Krishna. That is what Caitanya Mahaprabhu is doing with this sankirtan movement. He is giving the living beings the opportunity to develop love for Him. Love for Him means love for Radha and Krishna. sri-krsna-caitanya radha-krsna nahe anya; there is no difference between Caitanya Mahaprabhu and Radha and Krishna; except the Caitanya Mahaprabhu is even more, is most approachable. He is freely giving. because Srimati Radharani is more merciful than Krishna, and now Krishna is taking the mood of Srimati Radharani, He is giving love for Himself trough this harinam sankirtan. golokera prema-dhana, hari-nama-sankirtana this chanting of Hare Krishna gives love for Krishna. golokera prema-dhana, hari-nama-sankirtana, especially when we chant together, many devotes together, that love for Krishna starts to reawaken within the heart sravanadi-suddha-citte karaye udaya; the heart becomes purified. Actually love of Krishna is there in the heart of everyone, nitya-siddha krsna-prema sadhya kabhu naya, this is our original love. Now we have love of money, love of this and that. But our real consciousness, eternal consciousness, natural, healthy consciousness is love of Krishna. It is already there within the heart of everyone, it just needs to come out. And it comes out by this process of hearing and chanting. Actually by hearing and chanting and if you like dancing. And by chanting and dancing in Krishna consciousness very quickly one advances, step by step, on the path towards love for Krishna. So this is the method. 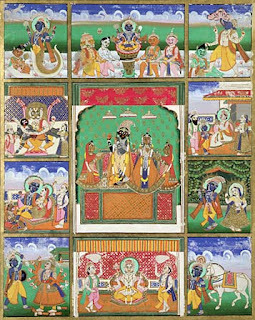 ...not simply by going to the library and taking out the book and reading... we may read all about Radha and Krishna and at the end of reading not understand anything or understand less, because we think, now i understand. But actually to understand is possible when ones heart is purified and the heart becomes purified by the grace of the Holy Name of Krishna and by the grace of Sri Caitanya Mahaprabhu who is distributing this Holy Name trough the Krishna Consciousness movement. Srila Prabhupada came to give this gift of chanting of Hare Krishna Hare Krishna Krishna Krishna Hare Hare Hare Rama Hare Rama Rama Rama Hare Hare. So let us go on chanting Hare Krishna and that will lead us toward the highest perfection of life. New York. “The delegation of demigods that sought up Lord Vishnu earlier this week to plead the case of Bhumi, the Earth welfare organization, has received assurances of His help”, sources close to the delegation said today. Precisely what sort of help He is offering is not yet known. The assurances seem to have been given personally to Lord Brahma, the head of the delegation in highly confidential message. Brahma than informed the other demigods. Highly confidential information in the message, the delegate said, convinced him that the message was authentic. No specifics of the message have been made available to the press. A spokesman for the delegation said only that Lord Vishnu had promised some sort of intervention. In response to a plea by a Bhumi, the Earth welfare organization, the delegation had gone to seek help in countering alleged pattern of political oppression and military build ups, the delegates said had become a global crisis. Spokesman for the major world powers say no such pattern exists. Mathura, India. “A king’s doter and a king’s son will soon marry here in the land that is home to their ancient dynasties”, a spokesman for the royal palace announced today. The marriage will be celebrated in grand traditional style. 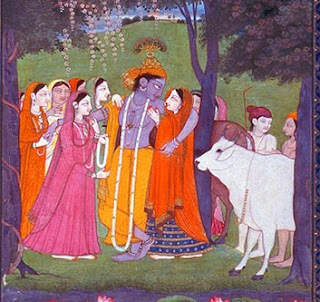 The bride groom is Vasudev, son of Surasena. King Surasena is a head of extensive kingdom that bears his name. He is the leader of the Yadu dynasty, an important royal family in the area. The bride to be, named Devaki, is the daughter of Devaka. Memebers of the royal family here are known simply by one name. Devakas brother Ugrasena is the king of Bhoja dynasty, another influential royal family. The wedding will be celebrated with pageantry, with processions, with rights and fanfare. And at the end of the ceremonies, the bride’s brother, following an old traditional custom, will drive the bride by chariot to her new home. “A girl here lives sheltered at home with her family till marriage”, explained Dr Satish Trivedi, head of the sociology department at Mathura university. “Then at marriage, she moves in with her husband and becomes as if wore a part of his family. 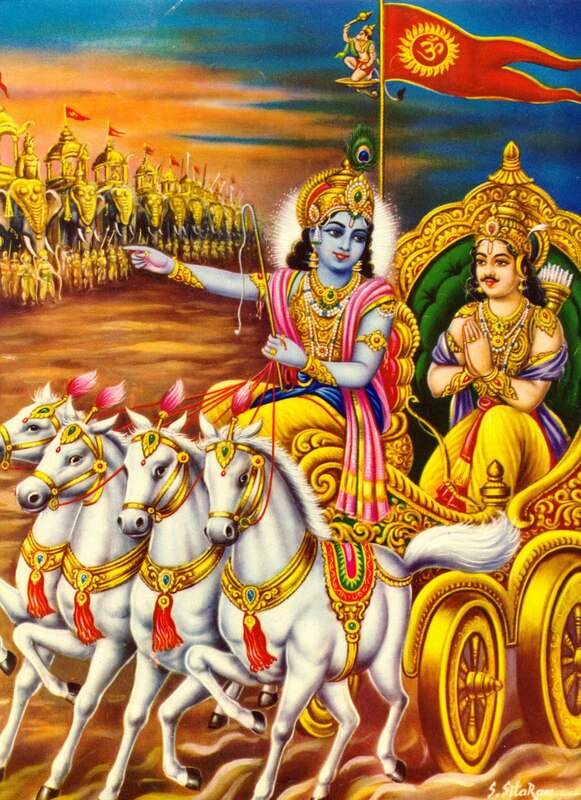 By driving the chariot”, Dr Trivedi explained, “the brother responds sympathetically to the sisters natural feeling of missing the home where she has grown up. It is really a heart touching custom”, Dr Trivedi said. Washington. Ever since the delegation of the United Demigods expressed alarm over global military build ups and returned from the milk ocean with reported assurances of help from Lord Vishnu, Lord Vishnu has been very much in the news. Multinational corporations worry about Him. Think tanks try to figure out His next move. Kings have said to fear His power. Everyone, it seems, has heard of Him. Still more puzzling, some reports say the Vishnu is indifferent to opulence and hardly cares about world affairs at all. According to French intelligence sources, what Vishnu most likes to do- despite His money, despite His power, despite everything- is just forget it all and live like a nomad in cow pastures somewhere in India. The French sources hinted, He has a fascination with local village girls. Two months ago, top level security officials from fourteen countries attended the conference, focused entirely on sharing information about Lord Vishnu. What they found out is that everyone has a different idea. According to one theory- it is all a bluff- Vishnu is just an ordinary man. Others say He is the single most powerful person there is. 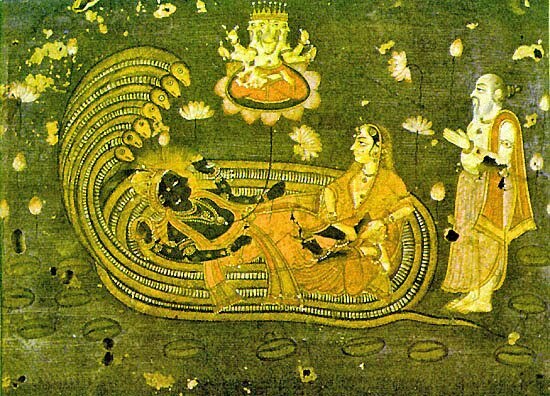 Another theory says there is no such person as Vishnu at all, an organization maybe, but not a person. 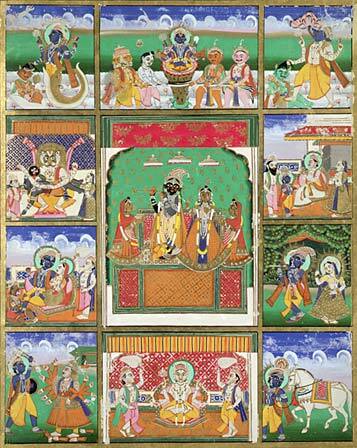 And then others say that there are many Vishnus, perhaps something like a Vishnu family, all working together. Speech should be beneficial, the most beneficial speech is to talk about Krishna. And ‘Priya’ that speech will be very pleasing also, the speech about Krishna will be pleasing to the ear and heart. There is nothing ultimately more pleasing than the message of spiritual realisation, the message of Krishna. Sometimes the message may not be so pleasing, but truth is not always pleasing but better to speak the truth as pleasingly as possible. But sometimes even if it’s not pleasing if it’s true and beneficial then it will ultimately be pleasing. ‘Thank you so much’ because it was for his welfare. You weren’t trying to merely agitate him for no purpose but you were speaking the truth for his ultimate welfare. So sometimes at the expense of being pleasing, we’ll speak beneficially and truthfully but if you can also be pleasing when you speak, that’s very good. Other artworks used with permission. jaswami.blogspot.com is not responsible for copyright infringement caused by it's members. If you feel your copyright is breached please let us know. We will remove the work in question.